Today another update is released, version 7yuv V2.2 with added support for Raw Bayer surfaces (7yuv homepage), as produced by digital camera sensors. 7yuv can view all 4 byte ordering modes RGGB, GRBG, GBRG, and BGGR, and up to 16-bit per channel. Most Bayer formats use only 10, 12, or 14 bits per channel, which are packed into the low bits. To configure this a new UI field has been added (see picture). 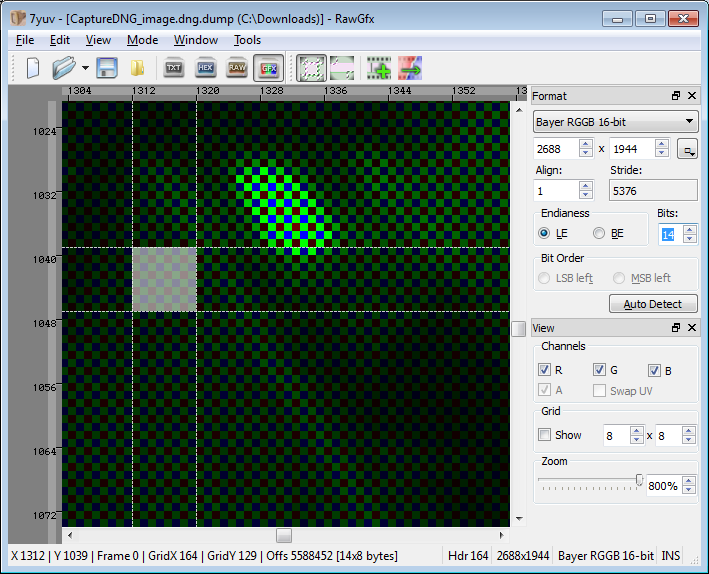 For now Bayer is supported only via the OpenGL rendering mode. Hint: When looking at down-scaled Bayer it is advisable to enable interpolation from the View menu to prevent scaling artifacts.